NOTE: This is an extremely popular tour and dates fill up fast, so make your reservations ASAP to secure your spot! Thanks to all of our past clients and now friends – you’ve made our tours tremendously successful! 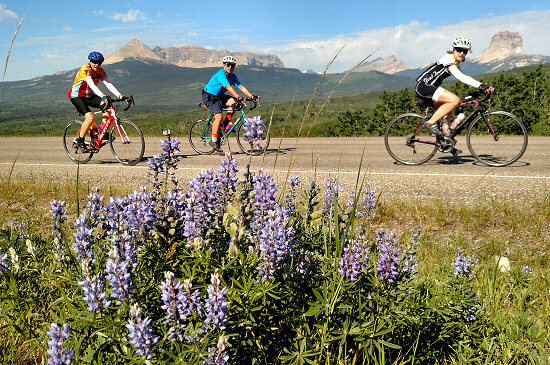 Join your friends at Lizard Head Cycling Guides for a northern locale that meets our standard for unique cycling, lodging and dining experiences. 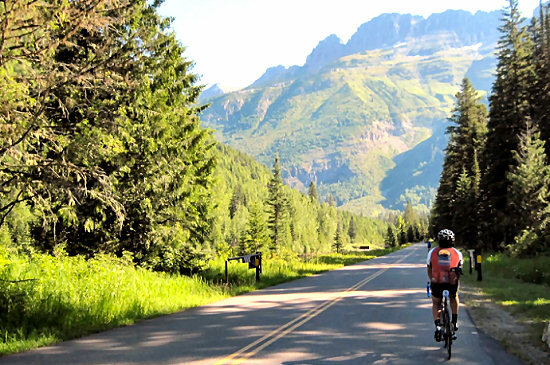 Glacier National Park is a bucket-list road cycling and hiking journey! 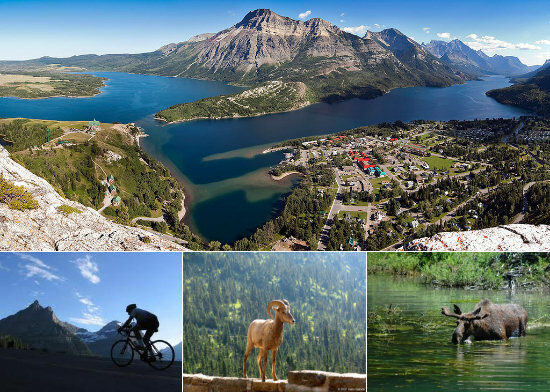 Each year Glacier National Park and its Canadian sister, Waterton Lakes National Park, deliver among our highest guest satisfaction rate. 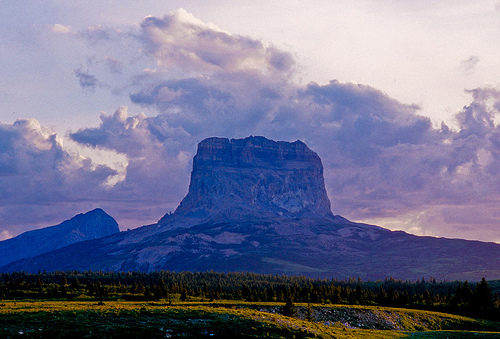 The mountains are gorgeoous, the riding is invigorating, and the scenery is second to none. This is your year for Glacier! 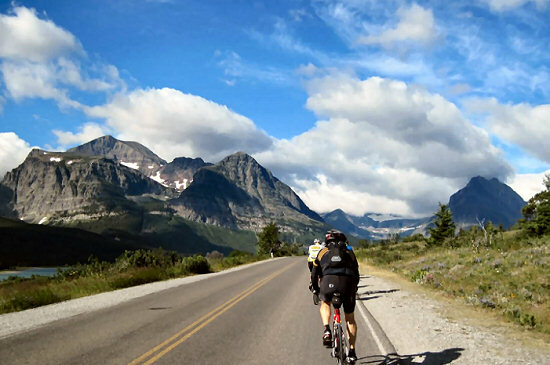 Why Ride Glacier National Park with Lizard Head Cycling? Going to the Sun, Anyone? 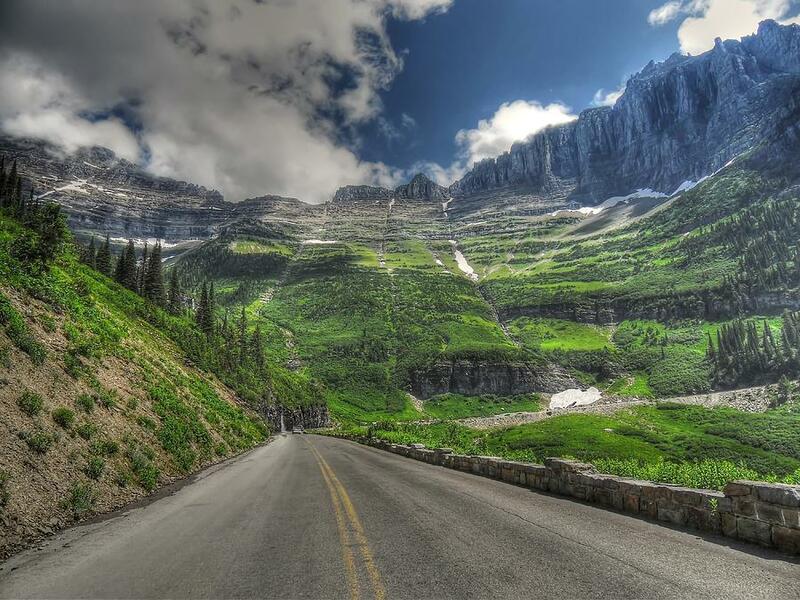 Going to the Sun Road is #6 of Our Top 10 Roads! July 7 to 12, 2019 (Book Now!) – TOUR A GO! I LOVED every minute of the ride/trip. Emily and Michael (the guides) were very helpful and kind. Thank you for creating rides that have a good amount of mileage and climbs. I’m soooooo glad I did this & would love to to do another. Lizard Head is fantastic and you “run” a great adventure business. Thanks for the spectacular adventure. 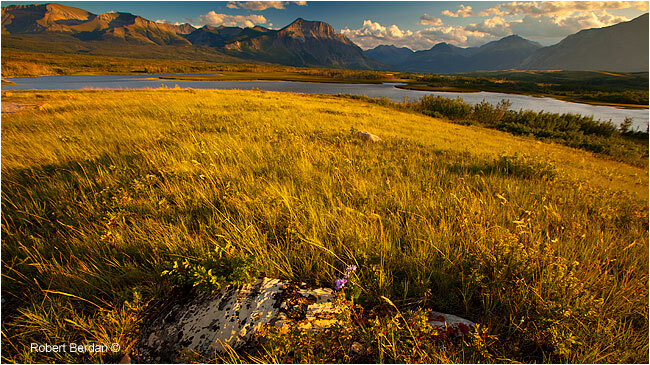 🙂 – Monique T.
My sister and I were recent participants on (the) trip to Glacier and Waterton Lakes. Emily and Michael were our trip leaders. I want to relate my thanks to them and my praise for their work. They were competent in all aspects of the trip–knowledgeable about biking tips and the terrain, a source of tons of information about the natural landscape we were surrounded by, and quite good cooks. They were also able to provide the proper amount of coaching to get us up the hills (our trip was a split of very experienced mountain cyclists and those who were not), and also know at what point a little “bump” would be helpful. I looked forward for most of the year for this trip. It went far beyond my expectations. 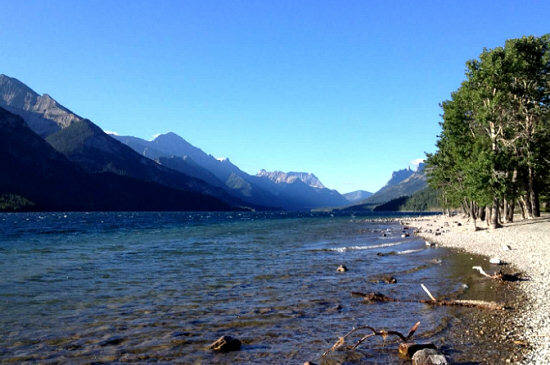 – Michelle G.
Starting & Ending Town: Whitefish, Montana. 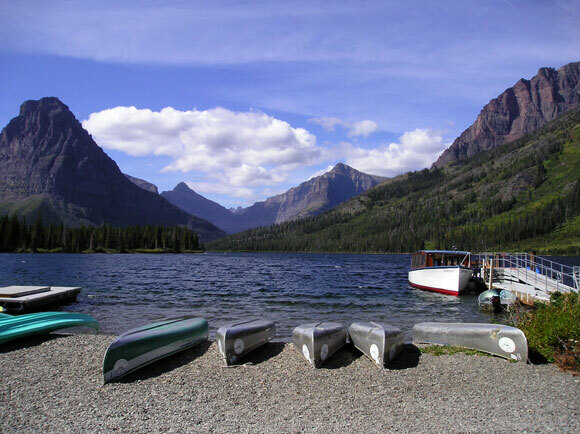 Flight & Shuttle: Fly into Glacier Park International Airport – FCA and take a shuttle to Whitefish, MT; or fly into Missoula International Airport – MSO and shuttle to Whitefish, MT on Big D’s Taxi ($325 for 1-4 people with each additional person a $25 up 10 people max). Post Tour Departure: The Glacier tour ends on Day 6 back in Whitefish at approximately 5pm after completing a 1/2 day of white water rafting. If you wish to fly out Friday evening, one can choose to not do the rafting trip and depart earlier on Friday from Whitefish in time for a 5pm flight. If you want to do this, please let us know. The guides will shuttle guests from the river put-in to Whitefish where one will take a shuttle to the airport. 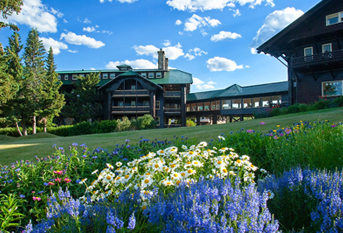 Meeting Hotel: Grouse Mountain Lodge 2 Fairway Dr, Whitefish, MT 59937. 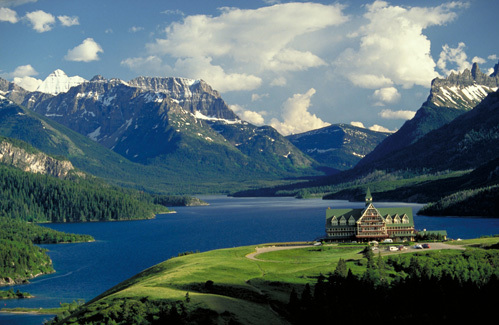 Many other lodging options exist in Whitefish, MT. Meeting hotel is not included in tour cost. NOTE: The Cheap Sleep hotel is fine hotel option for pre and post tour lodging. Tour Cost: $2,795 per person. Group discount of $200 per person for groups of 4 or more. em>Please see our Tour Discounts Policy. Single Room Supplement: Add $470- to the Tour Cost (total for 5-nights) for a private room while on tour. Tour Includes: 6-days of guide service, 6-days of meals (5-dinners), 5-nights of lodging, all taxes & entrance fees, lunch en route daily, energy food, liquid refreshments, shuttles and mechanical support. Alcoholic beverages, massage & bike rental are additional. 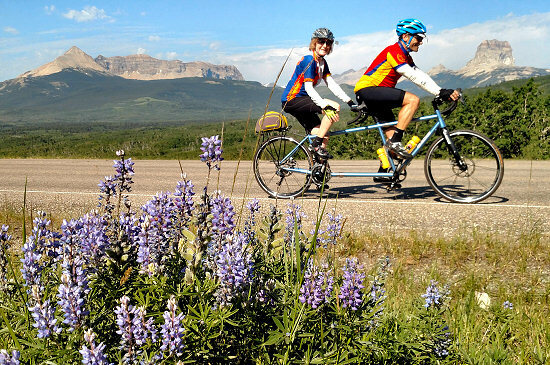 Glacier Bike Tour Ability Level: Lower-Intermediate to Advanced Cyclists. 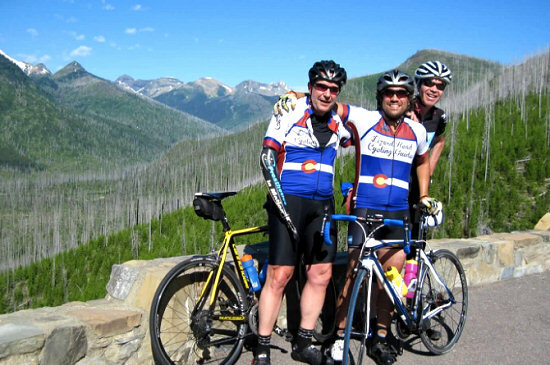 Although there are BIG climbing and challenging options miles here, this is a good bike tour for mixed abilities. Neither advanced nor intermediate cyclists will be disappointed. 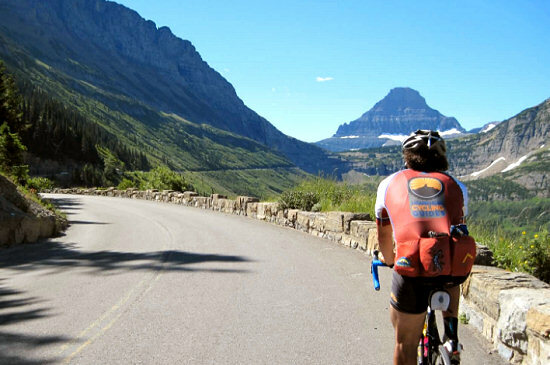 The details: Our Glacier National Park Bike Tour has suitable options for cyclists of all abilities. Ride as much or as little as desired. There are BIG climbs and bonus mileage options available each day. 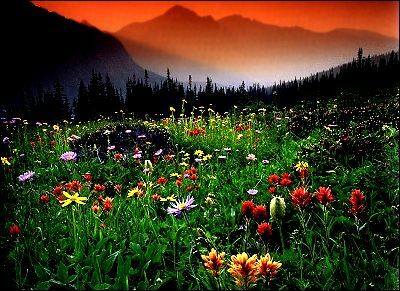 Both parks provide not to be missed hiking options to waterfalls, verdant meadows filled with wildflowers and mountain summits. 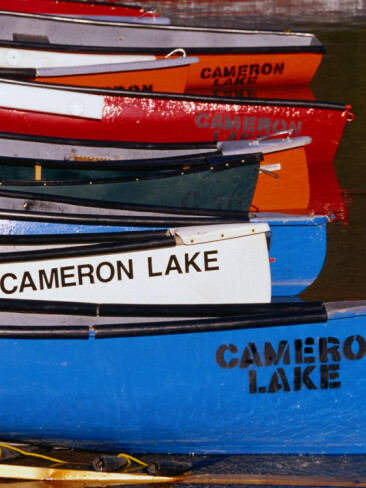 We’ll take a few of these treks to add variety to the week’s activities. 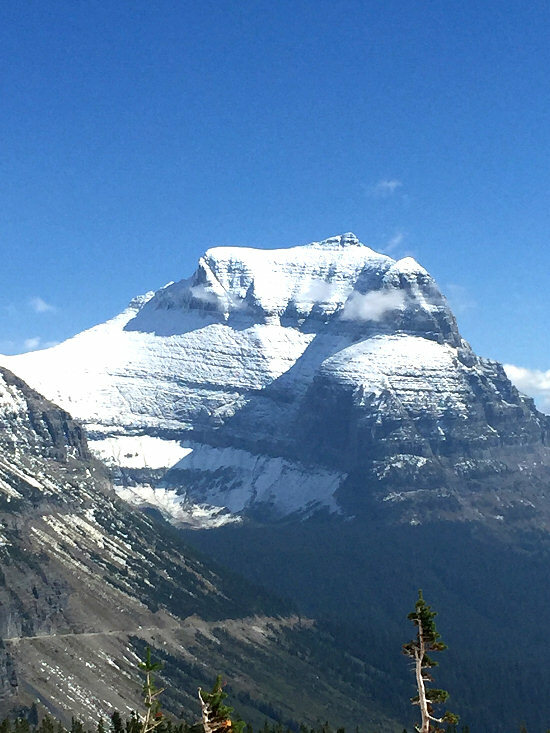 While we’ll remain in the confines of Glacier and Waterton, the scenery more than makes up for the relatively compact area of the tour. And since we will be venturing out in summertime, the far northern latitude brings extended evenings. Don’t be surprised if sunset arrives until 10:30 at night! 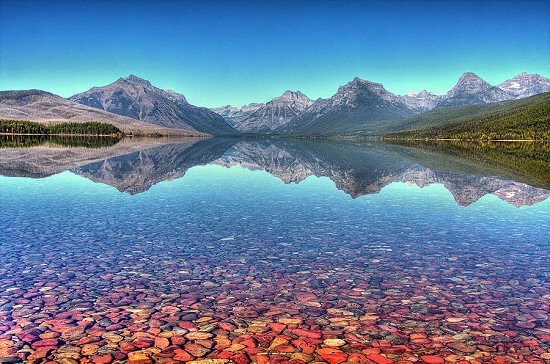 Our Glacier National Park Tour is one for any “bucket-list”. 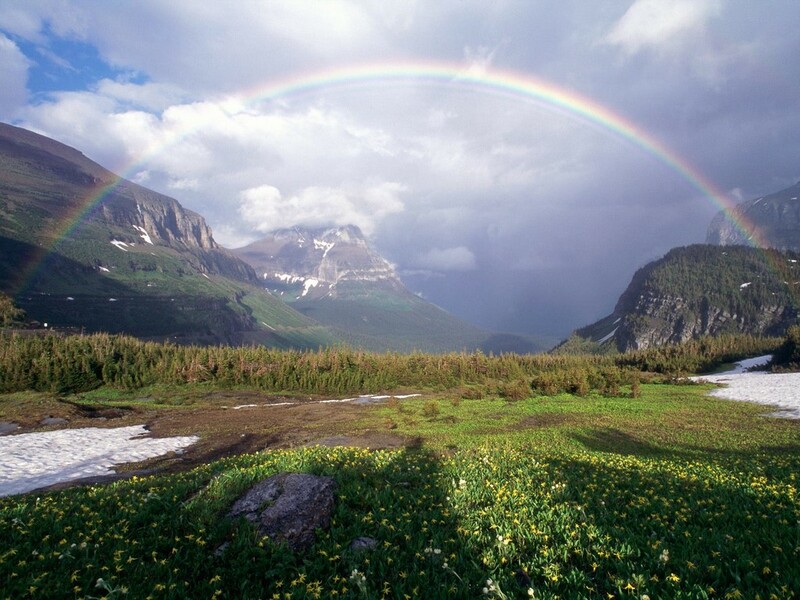 The weather: Summer in the Rockies demonstrates the full range of Mother Nature’s moods. You might enjoy bright sunshine at first. But in a matter of hours, you’ll hear thunderclaps and witness lightning across darkening skies. We are experienced in providing a safe riding experience for your and your fellow cyclists, should inclement weather arise. Why choose this tour? 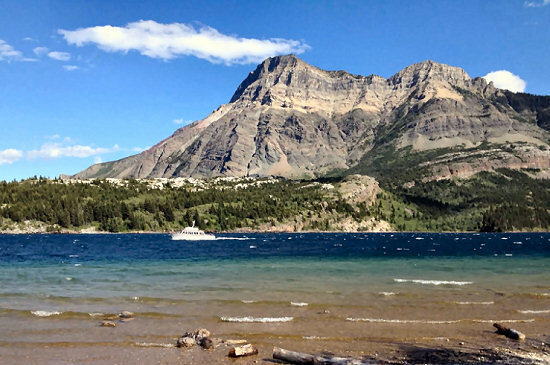 If you’ve never visited Glacier National Park or its Canadian sister, Waterton-Glacier, you just might want to see it the Lizard Head way. You’ll marvel at the intricate beauty of the landscape as you can only see on a bike. From Polebridge w return past the Apgar Mountains and back to Apgar Village where we check into the Village Inn, our lodging for the night. 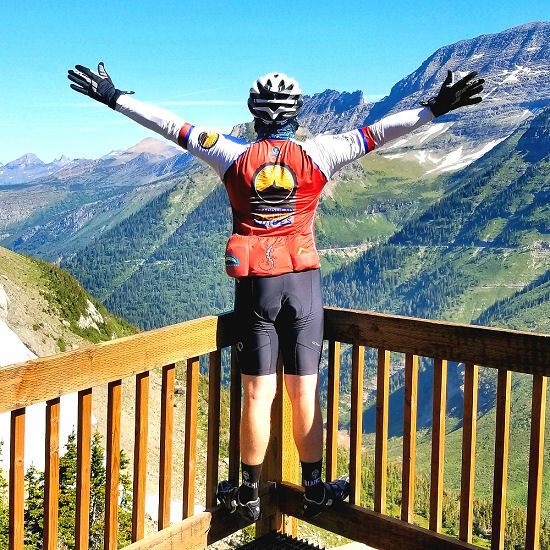 Those looking for additional cycling in the evening can take a spin on the legendary Going-to-the-Sun Road along Lake McDonald when it re-opens to bicycle traffic at 4pm. 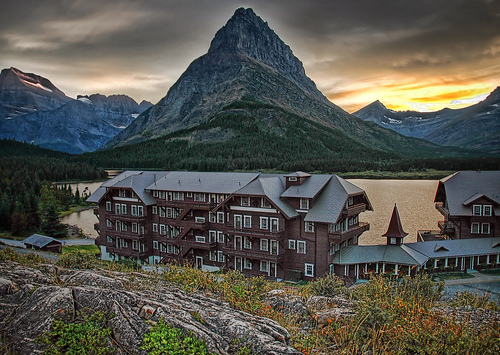 Our lodging this evening is the historic Glacier Park Lodge. Built in 1913 the hotel is a classic structure of the National Park system with a lobby supported by colossal 40-foot tall Douglas fir pillars. 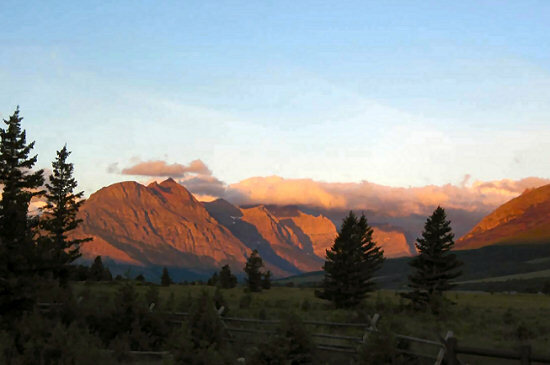 Guests are on their own tonight to explore for dinner in the town of Waterton. 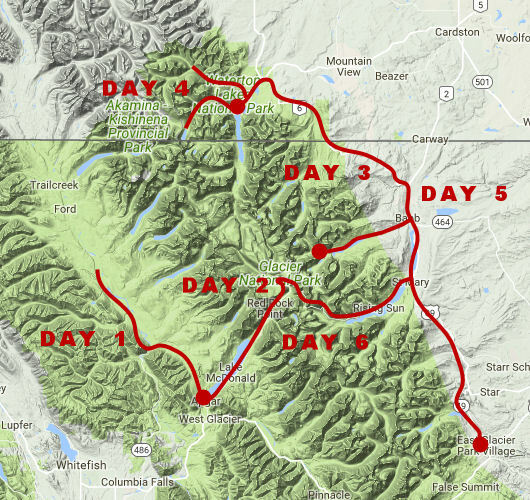 Day 6: Glacier Park Lodge to Running Eagle Falls & Whitewater Rafting! 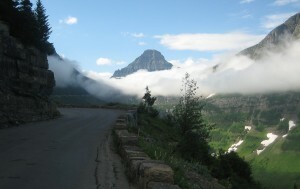 Today we ride Two Medicine Road, a lesser visited road in Glacier National Park that is comparatively traffic light. From the lodge, we ride north and follow it past Lower and Upper Two Medicine Lakes. 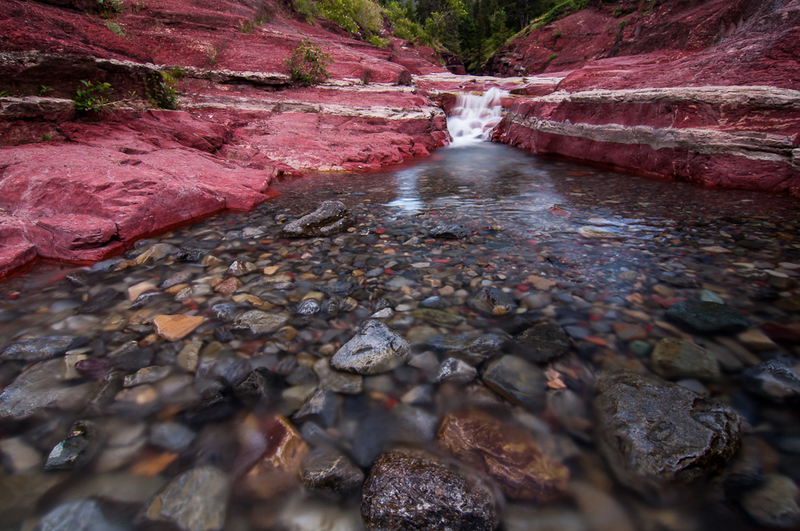 Along the way you’ll have an opportunity to take a short hike to view Running Eagle Falls. 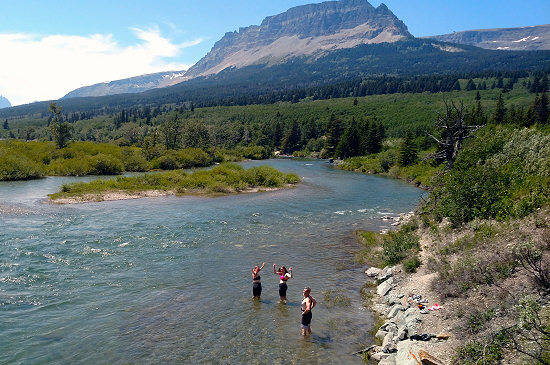 Our Glacier National Park Bike Tour ends with an beautiful 3 1/2 hour whitewater rafting tour down a class 3 section of the Flat Head River. The float ends in West Glacier where the Lizard Head Cycling Guides provides shuttle back to Whitefish. We’ll arrive back at the meeting hotel in Whitefish at approximately 6:00 pm. 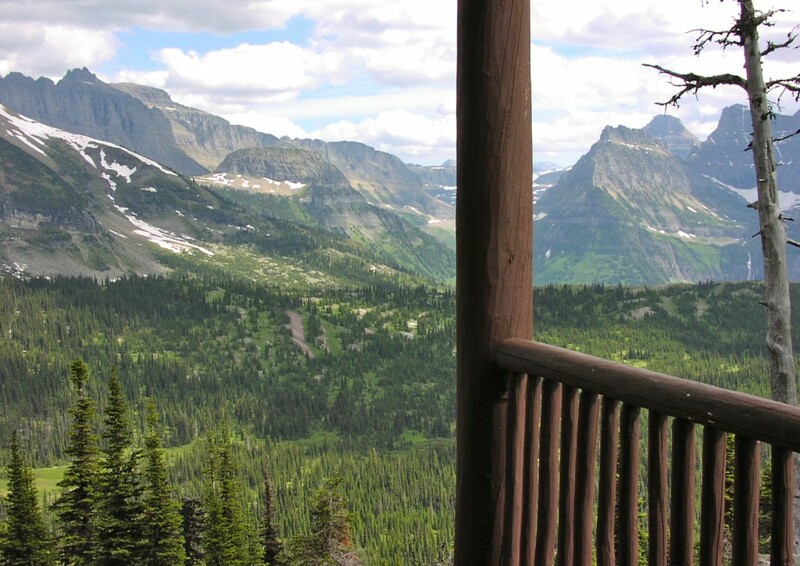 Lodging on the Glacier National Park Bike Tour: This includes lodging from five nights. Pre & Post Tour Lodging: Riders are responsible for their own lodging on the night prior to and post tour. Lizard Head Cycling’s meeting hotel is in Whitefish, MT. Contact us for details. Meals on Tour: All meals from lunch on the tour’s first day through lunch on departure day aside from dinner on Day 4. Breakfasts and dinners are in restaurants where clients either order off the menu or choose from a buffet. Our fresh lunches include salads, local fruit, vegetables and meats are served in roadside parks by the Lizard Head Cycling Guides. Any dietary preferences or allergies should be noted on the registration form. 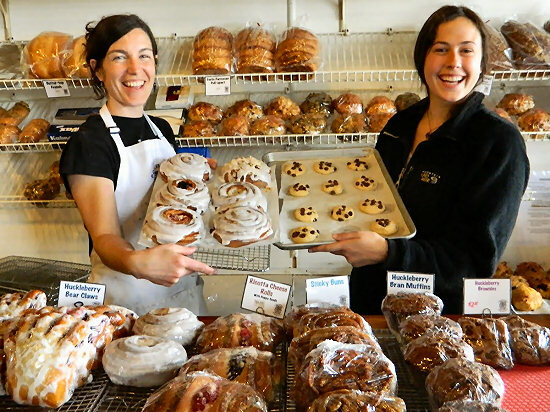 Each of Lizard Head Cycling’s lunches contain gluten free options. How the Shuttle Works: Tour Support A 15-passenger van and trailer that carries luggage, food and equipment supports Lizard Head Cycling’s tours. Cyclists keep a day bag that is accessible within the support vehicle. On trips with more then 13 riders a second support vehicle may be employed. The vehicle will sag and then pass riders to set up aid stations every 15 to 25 miles. This allows cyclists to linger at the back and then take a ten-mile, fifteen-mile or whatever mile “bump” forward to catch-up or get ahead of the group. Energy food, drink mixes, and fresh fruit are available throughout each stage. The Daily Schedule Cyclists ride their own pace. 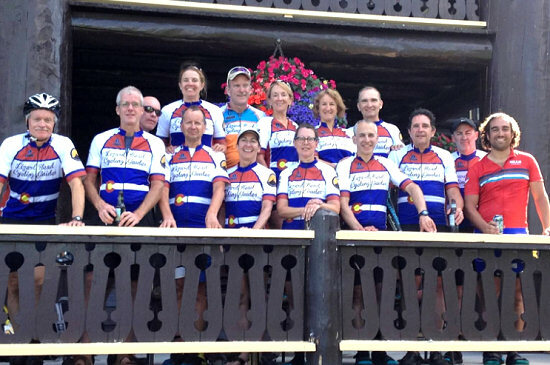 Lizard Head Cycling does its best to support riders in their varying desires and efforts. Cyclists can either use our tours to simply support their tour experience or to engage in a guided experience along the route. Q-sheets with directions, profiles and locations of aid stations are given out for each stage.